A parliamentary report of 1777 recorded parish workhouses in operation at Aberton (for up 16 inmates), Aldham (20), Great and Little Birch (24), Boxstead [Boxted] (30), Bures (9), Copford (30), Dedham (48), Fordham (22), Great Horkesley (26), Langham (25), Layer de la Hay (15), Marney (25), West Mersea (18), Stanway (18), Great Tey (28), Great Wigborough (20), and Wivenhoe (30). Boxted's parish workhouse was a cottage at the east side of what is still called Workhouse Hill. 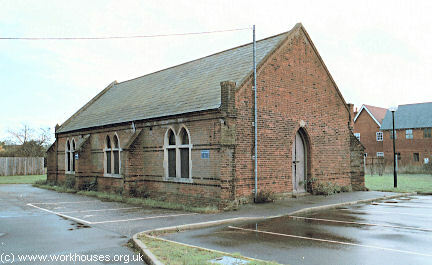 Boxted former parish workhouse, 2006. The Dedham parish workhouse operated between 1725 and 1835 in a converted L-shaped building on Crown Street. 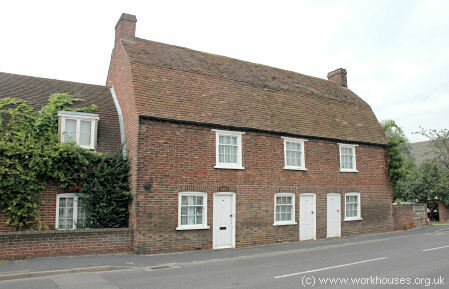 An adjacent house is thought to have been the workhouse master's house. In 1775, the master received one shilling per week to feed and clothe each inmate. An inventory taken in the same year included a workroom containing twenty spinning-wheels and four looms. Dedham former parish workhouse, 2006. 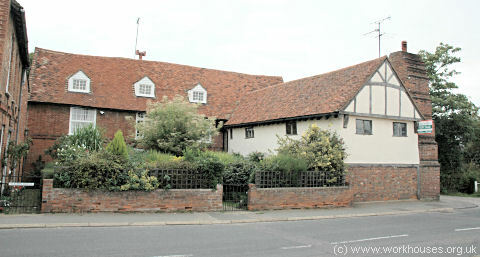 Dedham former workhouse master's house, 2006. 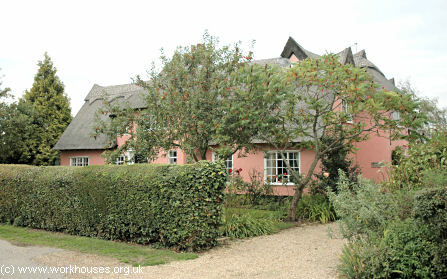 A cottage on School Road in Langham, now known as Keeper's Cottage, was used as the parish's workhouse prior to 1835. By 1813, only 13 inmates were in residence. Langham former parish workhouse, 2006. 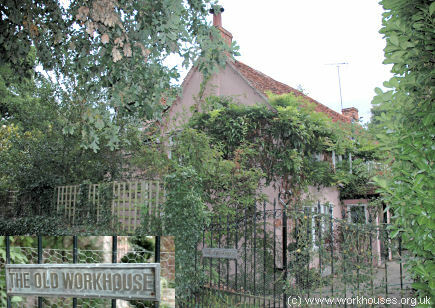 Little Horkesley's parish workhouse was in an isolated location at the north side of what is still called Workhouse Lane, about a mile to the south of the village. Little Horkesley former workhouse site, 1876. Little Horkesley former parish workhouse, 2006. 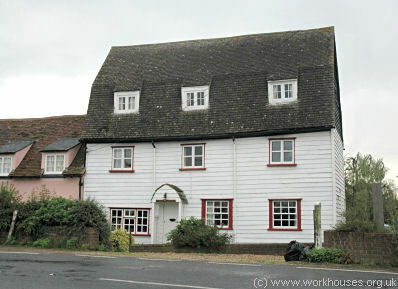 In 1726, a cottage at the east side of the Colchester Road was converted to become Wivenhoe's parish workhouse. 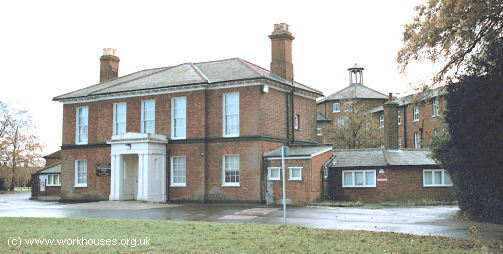 Wivenhoe former parish workhouse, 2006. 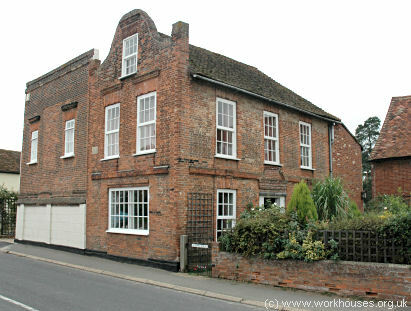 Wormingford's parish workhouse was a house at the south side of Bures Road. 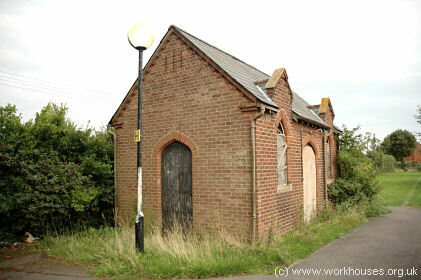 Wormingford former parish workhouse, 2006. County of Essex: Abberton, Aldham, West Bergholt, Birch, Boxted, Brightlingsea (2), Mount Bures, Chappel, Copford, Dedham (2), East Donyland, Easthorpe, Fingringhoe, Fordham, Great Harksley [Horkesley], Little Horksley [Horkesley], Langenhoe, Langham, Layer-de-la-Hay, Layer Breton, Layer Marney, Mark's Tey, East Mersea, West Mersea, Peldon, Salcott [Salcot], Stanway, Great Tey, Little Tey, Virley, Wakes Colne, Great Wigborough, Little Wigborough, Wivenhoe (2), Wormingford. The population falling within the union at the 1831 census had been 19,811 — with parishes ranging in size from Mount Bures (population 262) to Brightlingsea (1,784). The average annual poor-rate expenditure for the period 1833-35 had been £16,889 or 17s.1d. per head of the population. Initially, the new Lexden and Winstree Union retained parish workhouse premises at Dedham, Langham, Copford and Wivenhoe, until a new central union workhouse could be erected. 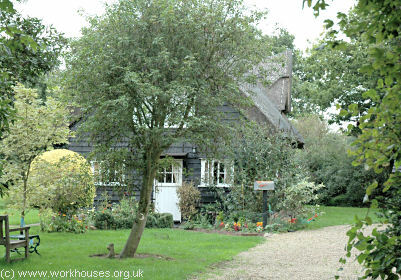 The new workhouse was built in 1836 at the south side of the London Road in Stanway. The building, which was designed by SO Foden and Henman, cost £6,800 to construct and could accommodate 330 inmates. Its layout was an unusual variation on the popular cruciform plan. Instead of the more common cross-inside-a-square or Y-inside-a-hexagon layouts, it comprised a cross-inside-an-octagon plan. This layout was also employed by William Thorold for the Norfolk workhouses at Depwade and Walsingham. However, the administration block at Lexden and Winstree was located between two of the radial wings, rather than being at the end of one. This feature was occasionally found elsewhere, for example in the Thingoe and Romford Union workhouses. The workhouse location and layout are shown below on the 1896 map below. Lexden & Winstree workhouse site, 1896. The entrance and administration block was located at the north of the site and would have contained a porter's room, waiting room and search room on the ground floor, with the board-room and clerk's office on the first floor. A passageway led to the hub where the Master's quarters were located. Lexden and Winstree administration block from the north-west, 2000. The four main accommodation blocks radiated from the central hub with women's accommodation thought to have been at the west and men's at the east. Single storey outbuildings formed the octagonal perimeter to the workhouse. Lexden and Winstree from the east, 2000. A two-storey infirmary (later known as Rose House) was located at the southern side of the main building. It was probably erected in several stages, beginning around 1850. 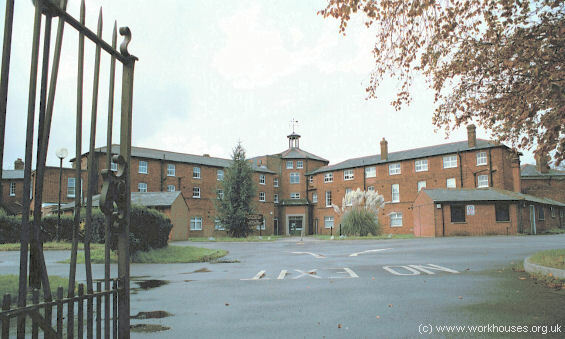 Lexden and Winstree infirmary block from the south-west, 2000. A laundry was located at the south-west side of the main buildings. Lexden and Winstree from the north-west with laundry at right, 2000. A chapel, probably dating from the 1880s, was added at the south of the site. Lexden and Winstree chapel from the north-west, 2000. 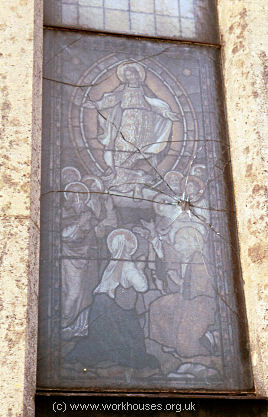 Lexden and Winstree chapel window, 2000. A mortuary, probably dating from the early twentieth century, stood at the east of the site. Lexden and Winstree mortuary from the north-west, 2000. Taken in 1929, here is a group photograph of what was possibly the final Board of Guardians before the union was wound up. 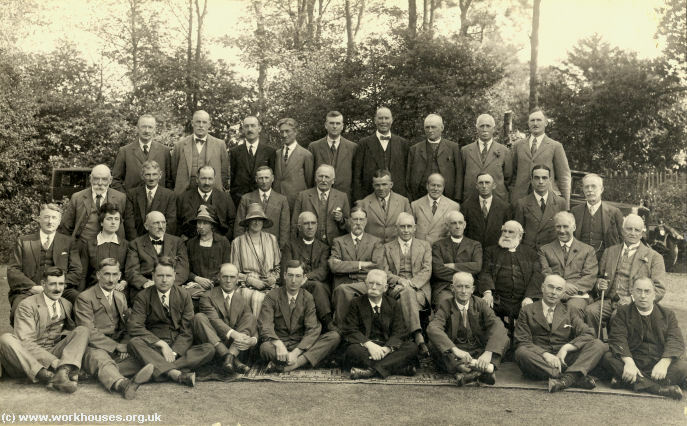 Lexden and Winstree Board of Guardians, 1929. The workhouse later became St Albright's Hospital but after its closure parts of the building were used as office accommodation by the local authority until 2005. Margaret Joan Wells-Gardner grew up in the Lexden and Winstree workhouse where her parents were Master and Matron. Ring in the Old, her memories of daily life, provide a fascinating insight into life in the workhouse in the first part of the twentieth century. The union operated a children's home at Stanway Villa which was located at the west side of Villa Road, Stanway. The building no longer exists. Essex Record Office, Wharf Road Chelmsford CM2 6YT. Relatively few records survive. Holdings include: Guardians' minutes (1836-1930); Ledgers (1836-1930); Master's report book (1863-70); etc. Edwards, Cristina (2010) Lexden and Winstree Union Workhouse 44 pages, illustrated. Copies available at £5 (cheques payable to Belhus Books) from the author at 1 Guide Post Cottages, Warren Lane, Stanway CO3 0LL. Tel. 01206-330474. Thanks to Liv Shand for very kindly donating the picture of the Lexden Guardians.